Alex Donovan and Emma Foley (front) are among students practicing in the hallway before the competitions. The halls inside Natick’s sparkling new, $78 million high school were bustling. Students scampered down thoroughfares labeled Main Street and Da Vinci Drive, headed to classrooms. Some called out to friends or gathered in fleeting clusters. But this was no typical day in high school. For one thing, it was early on a Saturday, a cold one with a snowstorm forecast; many of these teenagers’ peers were probably still in their pajamas. But many of the students here had risen before dawn, dressed in suits, and traveled from towns across the state. In the hallways, many walked deliberately, alone, reciting aloud to themselves. This was the Holly Speech Festival, the annual December competition Natick hosts for high school participants in the Massachusetts Speech & Debate League. 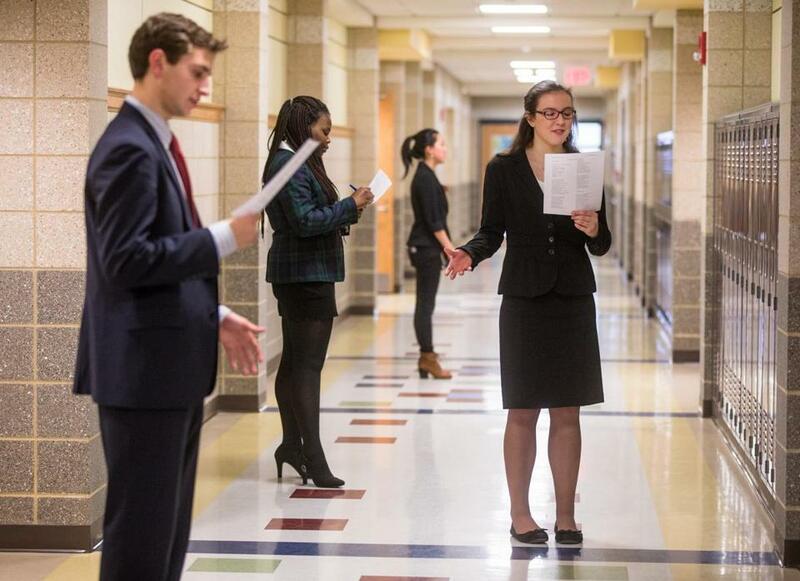 Three dozen schools — from Arlington, Lexington, and Milton Academy to Wahconah Regional High School out in Dalton — compete with teams of aspiring debaters, performers, and speechwriters in events through the school year. They’ll converge next on Newton South High School on Saturday. “It’s the best thing you don’t know about,” said Susan Marianelli, president of the board of the MSDL, also known as the Massachusetts Forensic League. That’s a line often repeated among students, parents, and speech coaches who believe the league’s competitions offer some of the most useful lessons high school has to offer. Launched in 1925, the National Forensic League (NFL) marked its one millionth member around the turn of the new century. There are currently 120,000 high school and middle school members nationally, representing nearly 3,000 schools; about 500 high schoolers participate in Massachusetts. But only select schools have speech teams, and the league is better established in some parts of the country — Texas, California, the Midwest — than in others. And as schools struggle with budget restrictions, a traditional emphasis on public speaking has flagged, speech officials say. For participating students, however, the benefits are apparent. Many go on to careers in law, policy, or communications, said organizers at the Holly. Others aspire to act on Broadway, teach, or go into sales. Events fall into four categories: public address; debate; limited preparation, which requires contestants to deliver talks with little or no time to get ready; and interpretive events, where students perform dramatic or humorous literary works or scripts. Participants say that the interpretive events draw those most interested in theater and performance, while the other contests tend to attract students with interests in public affairs, politics, and law. Coaches generally agree, but they also point out that some of the skills overlap, and the range of applications is practically boundless. Notable alumni of the NFL include Oprah Winfrey, Stephen Colbert, Renée Zellweger, John Belushi, Supreme Court Justices Stephen Breyer, Sonia Sotomayor, and John Roberts, Amazon founder Jeff Bezos and the statistician Nate Silver. Longtime Boston broadcaster Susan Wornick was one of the first speech students of Natick’s Jerry Dyer, a legendary figure in the community who was visiting the Holly as a coach emeritus, more than a decade after his retirement. “Speech was the single most important thing for me, not only in high school but in my entire education,” said Nate Richardson, a graduate of Shrewsbury High School and UMass Amherst who recently worked on Josh Zakim’s successful campaign for election to the Boston City Council. He was on hand to volunteer in the “tab room,” a temporary command center where events are run and students’ scores are tabulated. Austan Goolsbee, former chairman of the Council of Economic Advisers for President Obama and 1987 national champion in extemporaneous speaking, agrees. “It changed my life, really,’’ he wrote in an e-mail interview. Danielle Rosen, a Natick senior, stood outside another classroom waiting for a speaker to finish so she could enter. She was “double-entered” — competing in two events scheduled at the same time. It’s her eighth year of forensic competition, she said; she started in the junior program in fifth grade. When she heard the students inside the room clapping, she knocked lightly and entered. She strode to the whiteboard, where she wrote down her number (1127) and the title of her piece. As Rosen took a seat, a judge called up another young woman. Standing poised in a skirt suit and high heels, in front of an array of paper snowflakes, she scanned the room with unwavering eye contact and began reciting a personal essay about finding the courage to make a difference in the world. It culminated in a lesson learned on a summer study program she attended in Johannesburg. At these competitions, parents serve as judges, ranking by ballot and offering comments. Students typically compete in at least two rounds in groups of six or seven, followed by quarterfinals and semifinals at larger tourneys, and finals. At the end of each contest, awards are given out for individual events and team performance. The Natick speech team is the defending state champion. Local students who qualify also compete in national events. This year’s National Forensic League championship will take place in Overland Park, Kan., in June; competitors will vie for $200,000 in college scholarships. 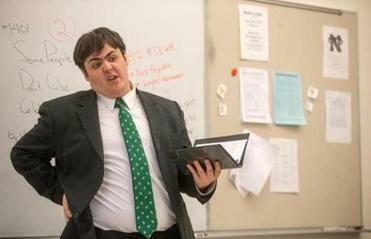 Despite appearances, what these overachievers learn on the speech team is not how to succeed, said Marianelli. It’s how to fail. Marianelli has coached the team from Milton Academy since 2004. A speech-team member in high school in her native Indiana, she returned to teaching after working as a systems analyst for IBM. She jumped at the chance to come to Milton. “Part of the reason speech is not as prevalent as it once was is funding,” she said. “In Indiana, I had to raise all the funds for us to go to tournaments. The only thing the kids could afford was the $5 entry fee. In another classroom, a volunteer judge sat at a desk in front of “Wanted” posters of Wild West characters: Calamity Jane, Billy the Kid. She took notes as the tall young woman at the head of the class delivered an extemporaneous talk. Her piece equated the strong public reaction to Obamacare to that over pop singer Miley Cyrus. Marianelli fears that speaking in public could become a lost art form in the age of the Internet. While virtually all former and present speech competitors agree that their communication skills improved markedly with practice, most note that the contests also taught them how to take full advantage of their own personal strengths.